Earlier this morning(April 11th) Kerry Washington was spotted arriving for an appearance on Good Morning America where she dished about the upcoming 'Scandal' series finale. 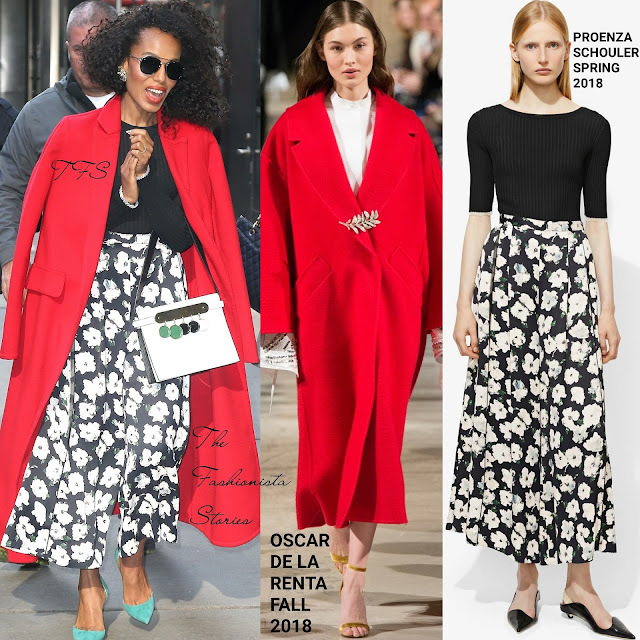 For her appearance, she kept warm in a OSCAR DE LA RENTA FALL 2018 red coat with a PROENZA SCHOULER SPRING 2018 black top and floral wide-leg, corp pants underneath. For a extra pop of color, she wore teal JIMMY CHOO pumps which is also a hue in her floral pants. On the beauty end, she went with side parted curls and minimal make-up. JENNIFER FISHER earrings, PRIVE REVAUX sunglasses and a EDIE PARKER bag finished up her look. You can get Kerry's Proenza Schouler pants via the designer's website HERE, BERGDORF GOODMAN, SAKS FIFTH AVENUE and FARFETCH.